Interesting advice on how to maintain and repair your R16. Complete story about the evolution over the years. A site about R16 made by Andy the Candy. Read about the record breaking R16 meeting arranged by Benoît Diringer on his site. You can also register for the next event, in 2007. Some nice pictures of R16 broschures, books etc. These are the subjects of this site. Lots of pictures and scanning of brochures. Andres Weil R16 site was one of the first on the internet. René's Renault pages has lots of information about various Renault models, including the R16. 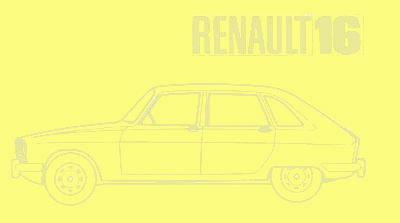 Olli's story about a Renault 16 TL -74 he used to own. Short story about Thomas R16 and some general info about Renault 16. The Swedish Renault Car Club. Australian Renault forum with lots of information about Renault 16. Very active. The French Renault vintage car club.